“Our study produced surprising results that are the opposite of what many conservationists had previously thought. It showed that the areas which had not been burnt since 1954 ended up with more heather and less peat forming species but the most frequently burned treatment had more of these species and did not stop carbon accumulation. 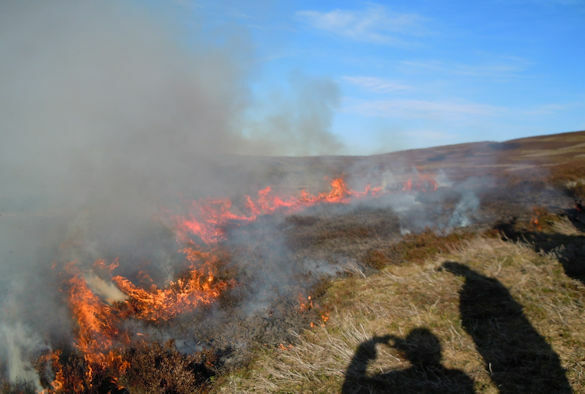 We advise that prescribed burning be used in some areas within a moorland management plan to minimize fuel loads. Moor House National Nature Reserve is run under the Centre for Ecology & Hydrology’s Environmental Change Network (NERC’s National Capability), and is included in the inventory of important experiments on the Ecological Continuity Trust’s register. Calibration of the changes in lead concentrations to a time scale was performed by Emeritus Professor Peter Appleby and Dr Gayane Piliposyan from the University’s Environmental Radioactivity Research Centre. The work was made possible by the Geotek Multi-Sensor Core Logging and Near Infrared Spectrometry facilities available within the University’s Central Teaching Laboratories, alongside specialist Energy Dispersive X-ray Florescence (Spectro XEPOS ED-XRF) in the Environment Change laboratories. Postgraduate students on Masters Programmes (MSc in Climate and Environmental Change and MSc Environmental Science) in the University’s School of Environmental Science contributed to the research. The work was part funded by a BioDiversa grant (NERC/DEFRA, NE/G002096/1) and the Heather Trust (whose small grant funded the radiometric measurements).